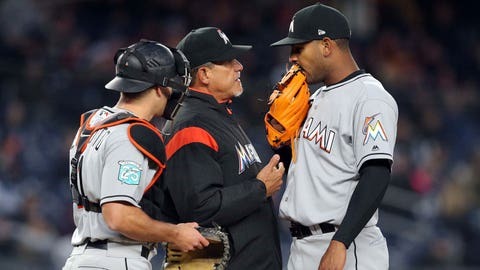 The Miami Marlins are parting with pitching coach Juan Nieves and three other coaches after their 98-loss season. MIAMI (AP) — The Miami Marlins are parting with pitching coach Juan Nieves and three other coaches after their 98-loss season. Also not returning in 2019 will be first base coach Perry Hill, assistant hitting coach Frank Menechino and strength and conditioning coach Ty Hill. All were on the staff of manager Don Mattingly, who will be back for a fourth season. The Marlins finished last in the majors in runs and OPS, and last in the National League in ERA and pitching strikeouts.